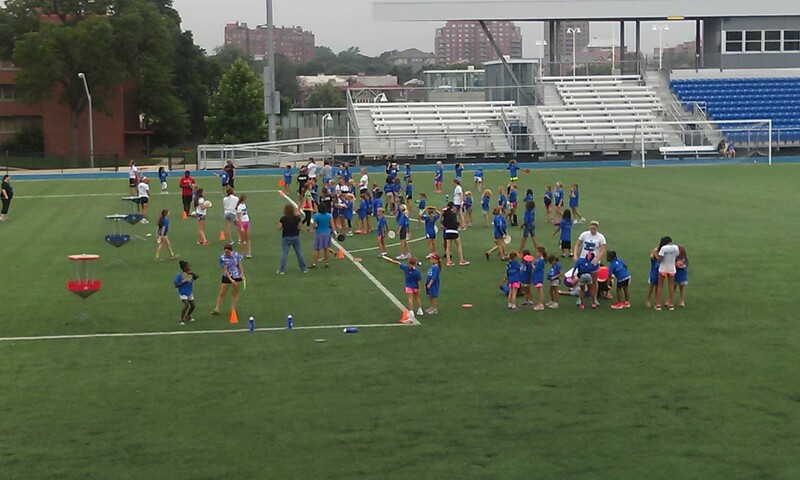 The Kansas City Disc Golf Divas and the KC Disc Golf Development Group had the incredible opportunity to participate in Camp WIN this summer. Camp WIN is designed to empower girls in our community by introducing them to over 14 new sports and fitness activities over four days. High school girls serve as team leaders, and instructors come from local universities, colleges, high schools and other area organizations. For more information on WIN for KC and Camp WIN, click here. We had 2 sessions on July 2nd. 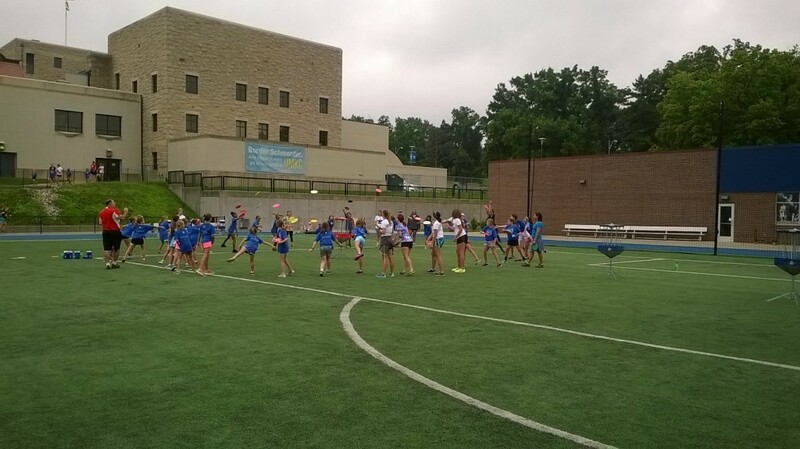 9:45 – 11:45 for ages 9-12 and 12:45 – 2:45 for ages 6-8 with approximately 120 girls in each session! The girls had so much fun, all smiles and positive attitudes- and so did we!! Our volunteer staff included Rhonda and Ben Crosby, LaRon Harris, Jaimee Crosby, Elisabeth Borg-Bowman, Ruthann Lammers and Cathi Stark. “I got a kick out of the chorus of ooohs and aaaahs when LaRon threw a driver diagonally across the field; “Daaaaaaaang!” and “Holy Moley!!! 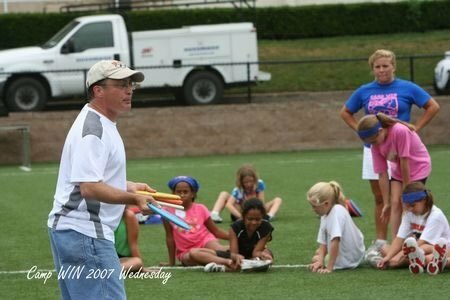 !” But I realized how important it was for us to be there when a little girl asked meekly “Can girls play disc golf too?” To be honest, it broke my heart a little. But yowza, those girls were there to play!! I had them finish out every putt, instead of walking back to the line after they missed, and they RAN to the disc when they realized they still had a chance to throw it in, no matter how many tries it took – ching!!!! 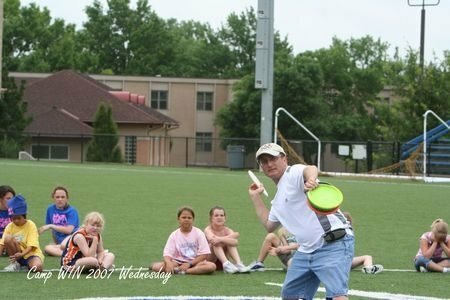 In 2007, Duane ‘CD’ Steiner participated in Camp WIN providing disc golf instruction to the girls. 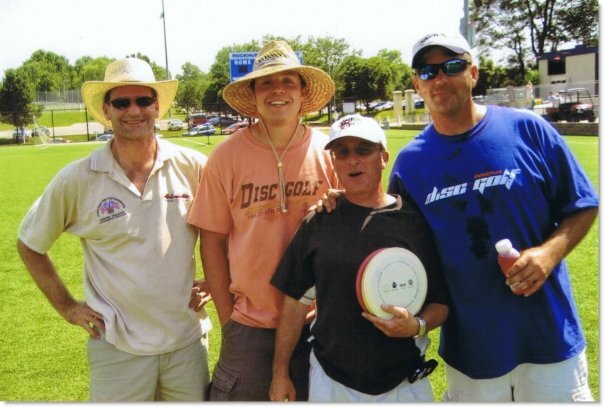 Then again in 2008 along with volunteers Steve Glover, John Theiss and Kevin Hart.